April 9, 2019 - John Kmiec, Directory of Marana Water, will present "Targeting Emerging Contaminants in Groundwater, A Utility's Perspective" at Tucson Chapter of the Arizona Hydrological Society monthly meeting held at Montgomery and Associates, 1550 East Prince Road, Tucson beteen 6:30 - 8:00 PM. September 25-27, 2019 - Arizona Hydrological Society will hold its Annual Symposium at Casino del Sol in Tucson on Sept 25-27, 2019. This annual event will feature a plenary session, over 50 talks, poster sessions,workshops, social events, and more! To learn more about this event, visit AHS 32nd Annual Symposium web page. We regret to announce that long-time AGS member Keith Richard Long passed away on March 29 in Tucson from complications related to colon cancer. Keith grew up in Santa Clara, California. He completed his M.S. in Geoscience at University of Michigan (1984), and his Ph.D. in Mineral Economics at The University of Arizona (1988). 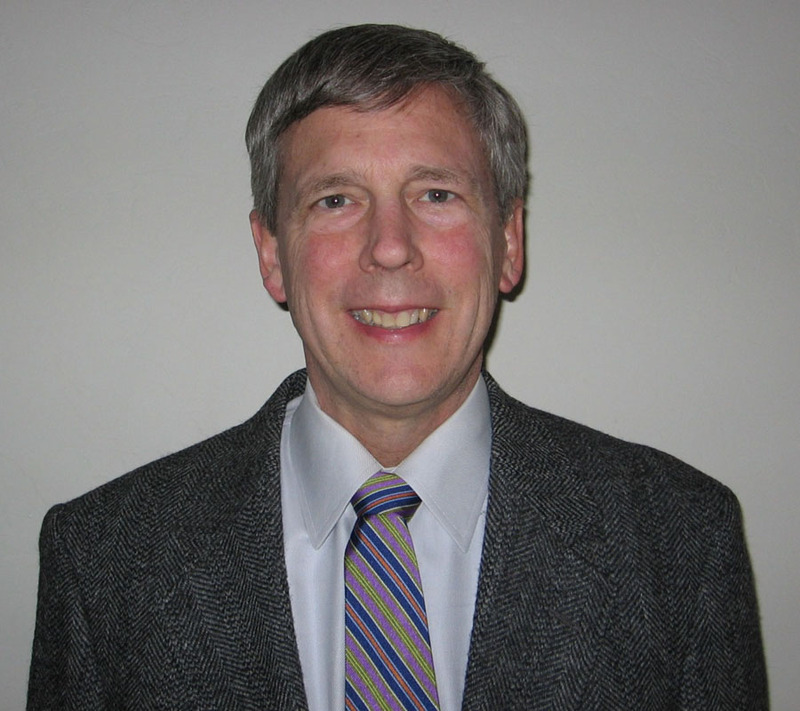 Keith joined the U.S. Geological Survey in Tucson in 1988, to work in the Center for Inter-American Mineral Resource Investigations where he participated in cooperative studies in Central and South America, especially Mexico and Boliva. Keith devoted his career to studying mineral resources and specializing in the economic aspects of mineral resource assessment. Focus of his research in recent years included work on the economics of porphyry copper deposits, economic filters for evaluating mineral deposits, the environmental aspects of historical mine tailings, and characterization of rare earth element deposits and significant metal deposits of the U.S. He wrote more than 100 publications ranging from country-specific studies of the mineral resources of Bolivia and the United States to work identifying and classifying abandoned mines in California (upcoming). Keith also published an English-Spanish dictionary of mining and geologic terms. He ended his career as a Research Specialist in rare earth minerals. His memorial service will be held at 2pm, Sunday April 14 at Grace Community Church, 9755 N. La Cholla Blvd., Tucson. The Arizona Geological Society's GSA Topical Session, “T45. Porphyry Copper and Related Mineral Deposits of Arizona, the Basin and Range Province, and Beyond,” has been accepted for the GSA Annual Meeting in Phoenix, Arizona – 2019. 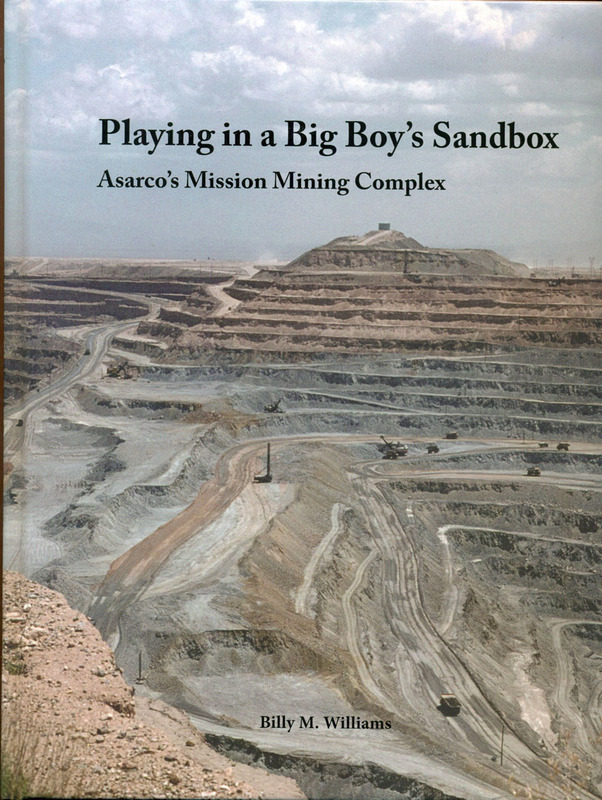 For you history buffs, there is a new book out on the history of ASARCO's Mission Mining Complex. Authored by Bill M. Williams, a retired mining engineer, who worked at Mission Complex from 1973 until 2000. It is a complete history of the northern half of the Pima mining district with numerous historic photos and maps. It also includes a chapter on the district's geology prepared by Bob Cummings with numerous color photos of mineral specimens that have been collected at the site. This book can be purchased at the ASARCO Mineral Discovery Center located at 1421 West Pima Mine Road in Sahuarita, Arizona for $60. AZGS' newest hire, economic geologist Carson Richardson and State Geologist, Phil Pearthree discuss the direction of AZGS Economic Geology Program. 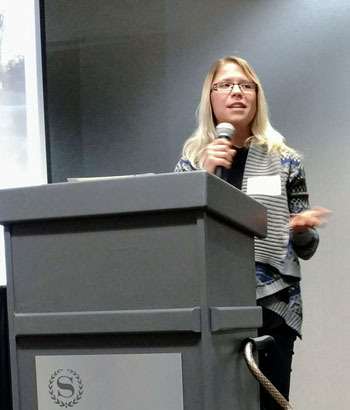 Our December dinner meetings have been time that the Arizona Geological Society presents scholarships to outstanding students at the state's three major universities: University of Arizona, Arizona State University and Northern Arizona University. This year, we had a number outstanding applicants for both the J. Harold Courtright and M. Lee Allison Scholarships, which made our job of selecting the best candidates very difficult. The 2018 Courtright Scholarship was presented to Alexandra L. Wallenberg. Alexandra received a BS in Geology from Illinois State University in May 2018 and currently attends the University of Arizona, where she is working on a Master's degree in Geosciences. 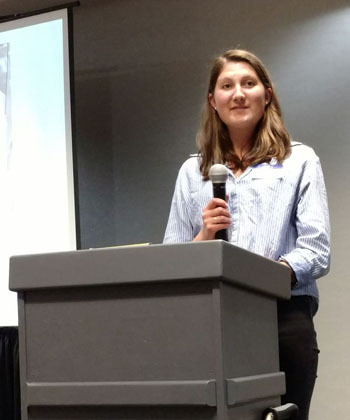 The title of her proposed research is "Gregg Canyon intrusive center, Sonoma Range, Nevada: Magmatism and Porphyry-Style Alteration-Mineralization." The 2018 M. Lee Allison Scholarship was presented to Lorraine Carnes. Lorraine received a BS Degree in Earth and Environmental Sciences from Lehigh University in May 2016, and currently attends the Arizona State University, where she is working for a Ph.D degree in Geological Sciences. The title of her Ph.D. dissertation is "Dating the Onset of Fluvial Incision into a Basin Fill Deposit in Southeastern Arizona." To learn more about these two outstanding scholarship recipients visit the J. Harold Courtright Scholarship and M. Lee Allison Scholarship pages on this website. At 8:46 AM on Saturday, November 10, 2018, Resolution Copper demolished the historical copper smelter stack at the Magma mine near Superior, Arizona. Deemed structurally unsound, this 293-foot structure was toppled in a controlled blast as a part of a larger reclamation effort at the West Plant site, which began in 2005 and is scheduled to be completed in 2020. To date, $40 million has been spent on Resolution Copper's rehabilitation efforts at Superior. When completed in 2020, the estimated cost of this project will be approximately $80 million. 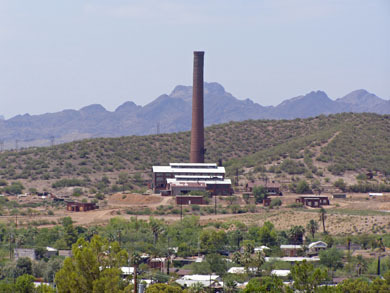 William Boyce Thompson and George Gunn incorporated the Magma Copper Company in May 1910 to develop recently acquired mining properties in the Superior area. These holdings became known as the Magma mine, which achieved production during 1911. During early development of the site, supplies were brought in by horse or mule drawn wagons from a railhead near Florence, Arizona. High-grade direct smelting ores were hauled to the railhead on the return trip for trans-shipment to ASARCO's newly commissioned smelter at Hayden, Arizona. Over the years, additional infrastructure was added to handle increased production from the Magma mine. A 200-ton/day concentrator was placed on line in April 1914 and a 36-mile narrow gauge rail line, connecting Superior with the Phoenix and Eastern Railroad at Magma Junction near Florence, was completed in May 1915. Magma Copper's smelter was commissioned in March 1924, eliminating the need to ship ore or copper concentrates to a distant smelter. This facility operated until July 1971, when it was closed in an effort to reduce costs. Following its closure, copper concentrates from the Superior operation were treated at Magma Copper's San Manuel smelter. After 71 years of production, Magma Copper suspended operations at Superior in August 1982 due to high operating costs and declining copper prices that fell to 73 cents/lb. With the rise of copper prices during the late 1980s, mining operations resumed in September 1990. Magma Copper's successor, Broken Hill Proprietary Company Ltd., suspended all mining and milling operations on June 28, 1996 after depleting its remaining mineable reserves. Discovered by a deep exploration drilling program in 1995, the Magma porphyry system is currently being readied for production by Resolution Copper Mining LLC, a 55/45 joint venture owned by Rio Tinto and BHP-Billiton. To date, nearly $1.2 billion has been spent on this project, which is scheduled to commence production in approximately 10 years. Located at a depth of 4,900 to 7,000 feet, this high-grade deposit is reported to contain a resource of nearly two billion tons, averaging 1.54% Cu and 0.035% Mo. It will be capable of producing nearly 25% of the United States' annual copper demand over its projected mine life of 40 years. The Arizona Geological Society is grateful for the Boart Longyear's sponsorship, which helps us offset the costs of our dinner meetings and other activities of the society. Arizona Geological Society is grateful to Freeport-McMoRan, Inc. for their generous support of our student members! Freeport-McMoRan is sponsoring student dinners for the 2018 AGS monthly meetings. We are delighted to announce that the AZGS offered the position of Research Scientist in Economic Geology to Carson Richardson this week, and he has accepted the offer. Carson is a Ph.D. candidate in the Dept. of Geosciences, University of Arizona. He is finalizing his Ph.D. research and will join our staff in January 2019. We received ~35 applications, interviewed 7 candidates, and brought in 4 finalists for presentations and interviews. Each of the finalists has strong qualifications for this position, and we appreciate their willingness to share their ideas with us. Carson’s chief task will be to build an economic geology program to support our mission to ‘provide technical advice and assistance to industry while encouraging the wise and prudent use of Arizona lands and mineral resources.’ He will join our geologic mapping efforts, focusing on mapping and assessing mineralized zones. He will also track mining trends in Arizona and will be the Survey’s primary liaison to the mineral exploration and mining community. Bio. Carson Richardson grew up near Peru, Indiana – the amateur circus capital of the world. He received his BS in Geology and Anthropology from Ball State University in 2012, and his MS in Geosciences from the University of Arizona in 2014. He has continued at UA working on a PhD, with an anticipated graduation date of Spring 2019. 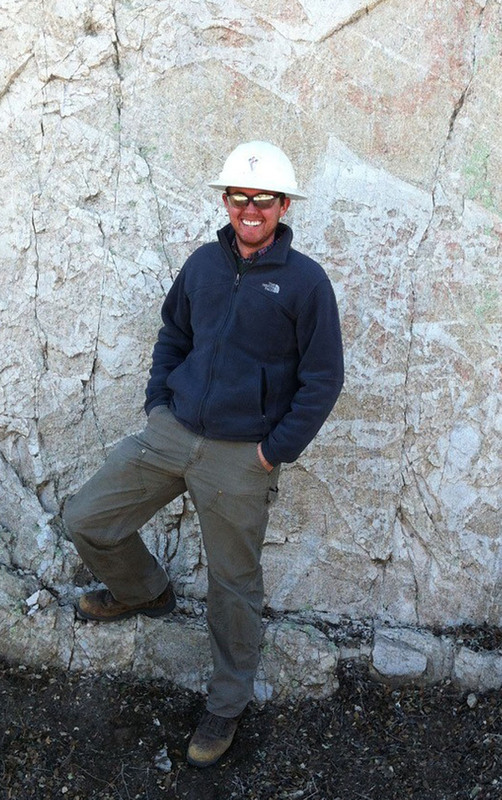 Carson’s research interests span economic and structural geology, but with particular emphasis on understanding the magnitude and timing of post-ore extensional faulting and its implications for the modern distribution of mineral resources. Bob Downs, Univ. 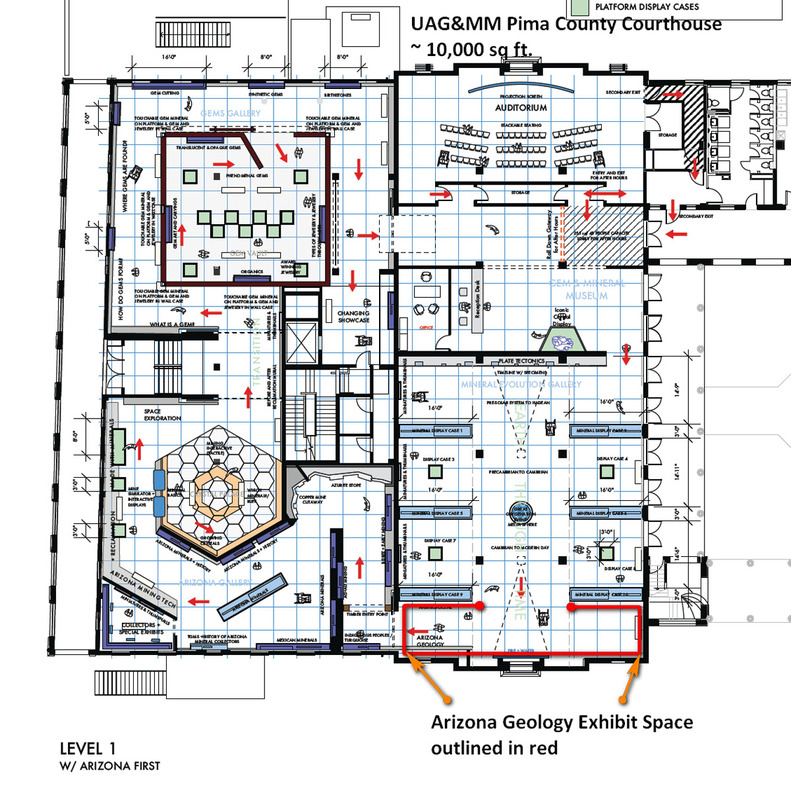 of Arizona Mineral Museum Curator & Prof. of Geosciences, is leading the effort to build out a University of Arizona Gem & Mineral Museum (UAGMM) at the former Pima County Courthouse in downtown Tucson. Building renovation is well underway with the museum scheduled for a soft opening at the Courthouse in Jan. 2020. Two of the museum’s chief organizers, Eric Fritz (Mgr.) and Les Presmyk (Mining Engineer & mineralogist), approached AGS’s Jan Rasmussen (former Curator of the Arizona Mining and Mineral Museum in Phoenix) and AZGS’s Mike Conway about helping design an exhibit focusing on the geology of Arizona. Jan and Mike have begun pulling together ideas for an Arizona geology narrative – one idea involves building a digital display showcasing Ron Blakey’s marvelous paleogeographic reconstructions of the Colorado Plateau and environs, complemented by geologic scenes, lithologies, and interviews as the cornerstone of the exhibit. HELP! But we want your help in gathering ideas on the elements of narrative (with visuals) expounding on Arizona’s geologic history. In short, we want your ideas, sketches, brainstorms, and musings to help us rough out a draft design by mid-July 2018 – 3 weeks away! This is an important opportunity for you to influence a future wide audience about Arizona geology. Audience. UAG&MM organizers anticipate a largely non-science audience of considerable age range and with limited knowledge of geologic concepts. Timeframe. Time is short. AGS & AZGS representatives meet with the UAG&MM design team in mid-July, so the sooner you share your ideas the sooner we can begin evaluating them. Financial Resources. Bob Downs, Eric Fritz and others in the management will pursue the financial resources for final exhibit design and construction. How to help! Please send your ideas, sketches, and experiences gleaned from other mineral or natural history museums to Mike and Jan at the e-mail addresses below. We can meet to brainstorm ideas before the July 3 AGS meeting to discuss ideas. Articles contained within the Arizona Geological Society Digests 1 through 22 are now available on-line at our publications page. Our out-of-print Digests are available to the public, While our in-print Digests are only accessible to AGS members. Anyone who is interested in purchasing Printed Copies of In-Print AGS Digests can do so on-line or contact the AGS Secretary for more details. Copies of current AGS Guidebooks and Digests are also for sale at a reduced price at AGS monthly dinner meetings.